Under the chupah, at the end of the wedding feast, and during the festive week after the wedding, we hear and rejoice with the Sheva Berachos, the blessings that begin with praise of Creation and climax with a shower of good wishes for the builders of a new home in Israel. Chassan-Kallah - we rejoice with you and wish every manner of blessing! But what is the simple meaning and profound significance of these heartfelt blessings and beautiful words? What are their lessons for the young couple and all who love them and wish them well? What are some of the inspiring teachings and warm anecdotes that lend flavor, joy, and meaning to the wedding day and the week that follows? 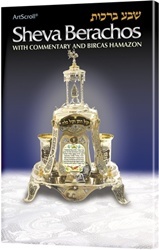 Rabbi Moshe Bamberger brings it all to us in this pocket-sized volume. A talmid chacham of note and skilled writer, he enlightens us from the wellspring of Torah thought, from the times of the Mishnah till today. 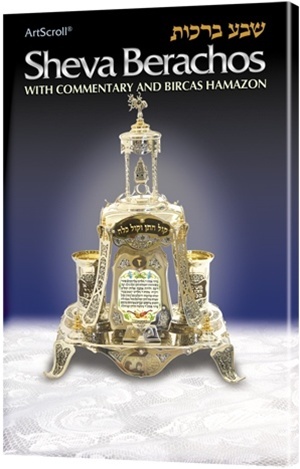 The volume also includes Bircas Hamazon/Grace after Meals - all with the ArtScroll translation. It's the ideal memento to present at weddings and Sheva Berachos.